Caprine Arthritis Encephalitis Part One: What is CAE? 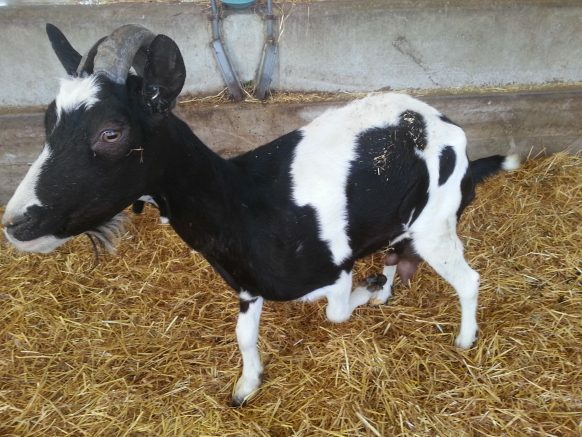 Caprine Arthritis Encephalitis (CAE) is a progressive, debilitating, and contagious disease in goats caused by a lentivirus, meaning it is a slow growing virus, which is one of the reasons it is hard for producers to control. This type of virus has a long symptom free incubation period followed by a gradual onset of disease, so goats can be spreading disease within the herd but not showing any outward signs that they are infected. The disease is often painful and severely limits production by preventing goats from accessing feed, leading to weight loss. CAE may also cause mastitis or a drop in milk production. There is no known treatment for CAE, so prevention is the best way to minimize the impact of this disease on your farm. This joint has locked up as a result of CAE. The CAE virus lives within white blood cells that circulate in the blood stream to fight disease. They are also able to travel into other body fluids such as milk or mucous. There are five main presentations of the disease, with arthritis being the most common in Canada. In an infected doe, the virus is present in every joint, however the joints that become swollen and painful are those most commonly used. When a joint is overused or bruised, it stimulates white blood cells to enter the joint, bringing in more viral particles. This is why the knee joint and the joint where the head attaches to the neck are most commonly affected. Clinically infected joints swell slowly, show no heat or pain response to touch, but are extremely painful to walk on. The second most common form of the disease is meningitis. This occurs when the virus affects the tissues of the brain and spinal cord. It is most often seen in animals less than six months of age, and symptoms develop much more quickly than the arthritic form. In just a few weeks kids will become progressively weaker; unable to stand on the hind legs first and then on the front. Kids will still be bright, alert and responsive, showing no signs of fever and still maintaining a good appetite. The mastitic form of the disease, more often referred to as “hard bag,” usually appears in first time doelings that come in with udders that appear large and full but have no milk. The udder will not be hot or painful, but is quite firm to touch. Less often diagnosed are pneumonia and progressive weight loss. In CAE infected goats, symptoms typically appear around two years of age, but can appear at any time in adulthood. Goats displaying signs of CAE should be seen by your herd veterinarian. Diagnosis can be made by blood testing. Ensure that CAE affected goats are culled early, so they are still fit to ship. Shipping is stressful, and can cause a sick goat to become much worse quickly. Remember, it is better to ship a goat a week too early than a day too late. If a goat is diagnosed with CAE and the disease progresses to the point where they are no longer productive members of the herd and are not fit to ship, humane on-farm euthanasia is recommended to minimize suffering. CAE can be spread through contact with milk, saliva, or mucous of infected animals, via coughing, and possibly via other routes if infected and healthy goats are mingled. More research is needed on additional routes of transmission, but until the research is available, it is safest to assume that any contact with infected goats, bodily fluids of infected goats, shared airspace or ventilation, or sharing equipment with infected goats may transmit CAE. To prevent the spread of CAE in your herd you will need to control the spread of these body fluids. The virus can survive outside the body until the fluids have dried up, meaning if a goat coughs and leaves mucous on the wall or drops milk or birthing fluids on the floor it has the potential to infect goats for several hours. This means that using the same alleyways or handling equipment for infected and uninfected goats can spread disease, even if the goats never see each other. CAE is a serious infectious disease that reduces production and is a threat to animal health and welfare. CAE is easily spread, and healthy goats can be carrying the virus. The next issue of the Goat Gazette, “Caprine Arthritis Encephalitis Part Two: Preventing and controlling CAE” will discuss steps producers can take to minimize the impact of the disease on their herd. Ontario Goat represents Ontario’s milk, meat and fibre goat farmers with a united voice and is dedicated to enhancing the goat industry through education, collaboration, innovation and strategic alliances. Copyright © 2019 Ontario Goat.